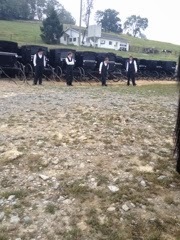 Yesterday, my husband's Amish brother got married. 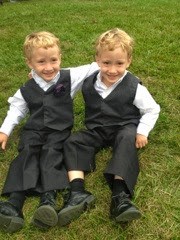 Here are the adorable nephews of the bride, twins named James and Joel. 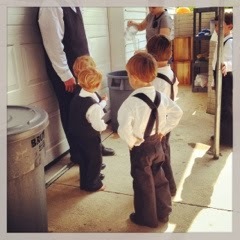 The only way we could tell them apart was James wore the flower pin (made by the bride) on his vest and Joel didn't. 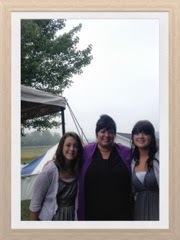 We arrived at the wedding at 6:30 a.m. 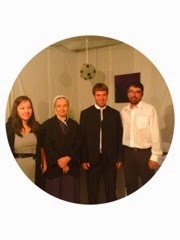 The wedding ceremony didn't start till 8:30, but they asked the family to arrive early. We were excited for what the day would bring us. Well, I'll admit, our three kids were a little apprehensive about this early morning adventure. 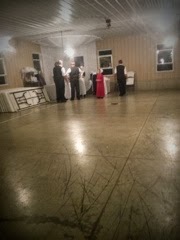 ...as we made our way inside of the brides family's home where the mother of the bride was pinning the final pins on the bride's Amish dress. 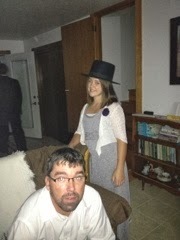 Sydni was being silly when she put on her uncle's (groom) Amish wool hat to make her look cuter than her attire already was. 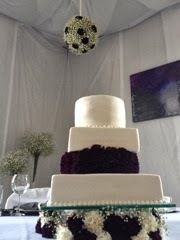 Here are the bride and broom in the "eck," which you might remember me mentioning in the blog that's in part 1 of 2. 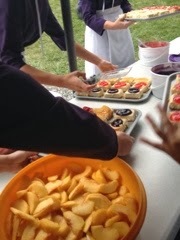 The bride always wears a navy blue dress with a white cape and apron. She wears the black cap at the ceremony. Since she's still a unwed women. You'll notice that later in day she changed her covering to a white one for the reception, since she is then a married women. The groom wears the suit that he wears to a church service. 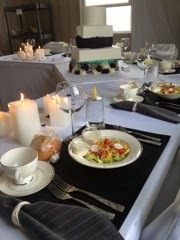 This is the wedding cake. The flowers were dark purple with white baby's breath. There were battery lights displayed in the bottom layer of flowers. 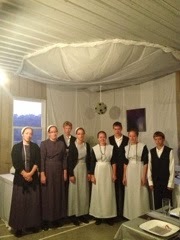 Here are all the siblings with the bride. She had sisters that were already married. They were such a respectful family, and we enjoyed working alongside them. This is us with my husband's mom's side of the family. 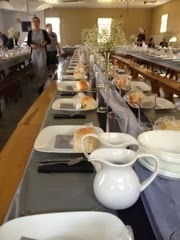 Soon the cooks and the table waiters arrived to start the final prepping for the noon meal. 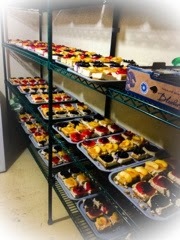 Here, they were putting the final touches to the cheesecakes. 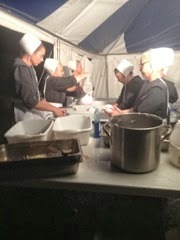 Once the chicken fryer ladies were done with the chicken, the next shift of cooks moved in with the dressing (stuffing) frying task. 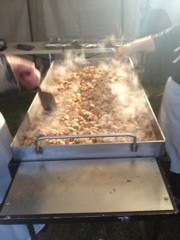 It smelled heavenly as you walked into the tent where these fryers were set up under. I asked how much butter is melted on the grill before the stuffing is added. Yes! A whole pound each time! 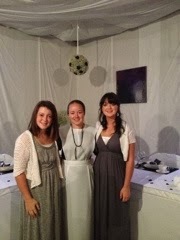 Sydni, Marlene (bride), and Felicia. The girls are excited to have received a wonderful new aunt. 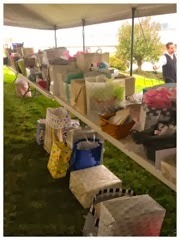 ... buggies all lined up. 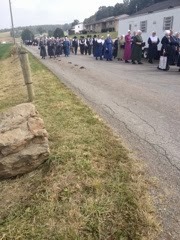 Not sure why, but this picture reminds me of a scene out of Amish Mafia, not that I support that show, which does NOT show the real, authentic lifestyle of the Amish. I was so proud of my girls as they accomplished their assigned duties of the day. 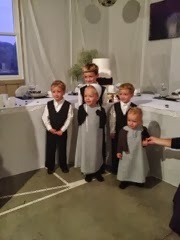 This was a first time for both of them to have a part of an Amish wedding. Felicia, on the right, speaks Dutch fluently so that helped her communicate with the other help. Sydni, however, is almost fluent. She can understand it and speak some of the language. 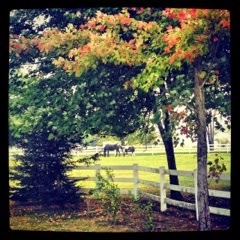 I think I could have shared 100 pictures with you of the day. There was a book being passed around to write messages to the newlyweds. Here, Marnita was writing a message to the bride to make sure to soak the groom's cereal every morning, one of the requirements from the groom when he asked her to marry him. Once the tables were all prepared and the food was ready, around 10:30, the family walked to the ceremony two houses down from the bride's home where the reception was held. 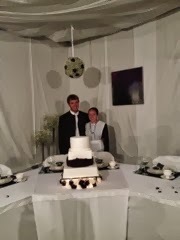 Soon after, the cooks and table waiters and "hosllers" filled in when it was just in time to see the vows. No kissing at the ceremony. I wanted to respect the church and not take any pictures during this part; however I did have permission to take the pictures and write a blog on this wedding. ...in great anticipation of amazing food. 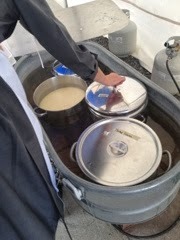 The above picture shows the warmers where the food is kept hot until served. It's kept at a 175 degrees. 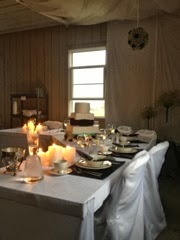 Here the tables are all set and ready for guests to be seated. 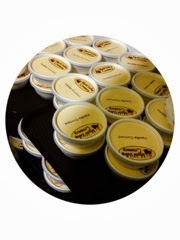 ...and a freezer filled with 650 Mud Valley Creamery ice cream cups. 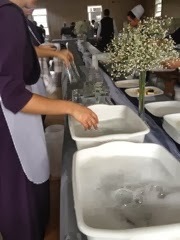 ...as the table waiters washed the dishes and reset them for the evening meal. In the middle of the afternoon, after a little mishap of a little girl falling on a bench and breaking her leg, the couple started opening their gifts. The bridal party helped them, and the groom announced who gave the gift and thanked them as we watched. It was cute at the end of this blessed part of day when the groom attempted to lift up the bride and thanked her parents by name for the best gift of all. The thoughtful act was sweet and brought tears to my eyes. 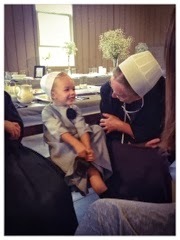 As we sat around and visited in the afternoon, I got to meet some amazing Amish women. 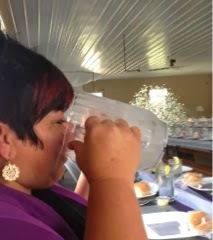 They loved the Pepper and Peach Smoothie recipes I shared with them. 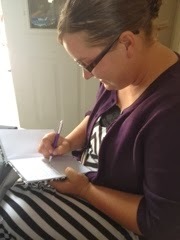 And I jotted down a couple of new ones from them, too. 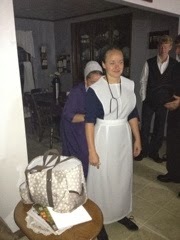 I told my Mom this morning that if I ever went back to the Amish lifestyle, I'd want to live in that church district. I talked to the bishop's wife for probably an hour on life in general--about cooking, raising children, the differences in our lifestyles, faith and trials. I have the utmost respect for these ladies as they treated me as one of their own. 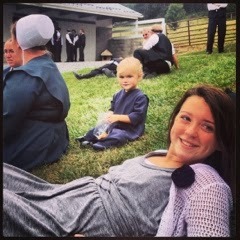 I met the coolest Amish lady I know, next to my Mom. Her name was Ruth Chupp, and I know our paths will cross again. She loves a lot of the same things I do, and I could instantly connect with her on a deeper level. 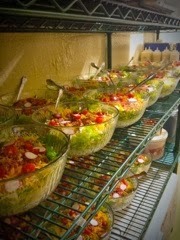 At 6:30p.m., everything was ready to go for the second time around. 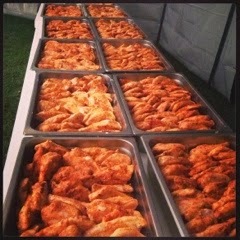 This was where the youth showed up and filed in to eat and sing. 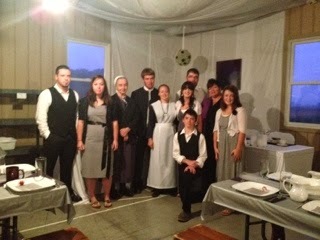 We (Allen and I) served the bridal party for the evening meal along with the bride's married siblings. This is where we grilled and served them steak. Here is a picture of the shop where the reception was held and five minutes (I'm not kidding) after the guests got up to leave it was all cleaned up. Everyone in the room helped as a team, and tables were cleared and tables and benches were stacked and ready to be transported to the next event. I had to chuckle at the expression on my husband's face as this task was underway. 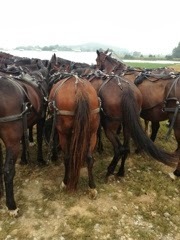 One thing that is so admirable about the Amish is the teamwork and the work ethic. Here, the ladies were all helping each other wash the dishes at 9 p.m.
As I sit in my office looking out my window writing this blog, I'm feeling extremely blessed with the heritage I was raised with, and I am more thankful then ever for all that was instilled in me during my childhood and after. 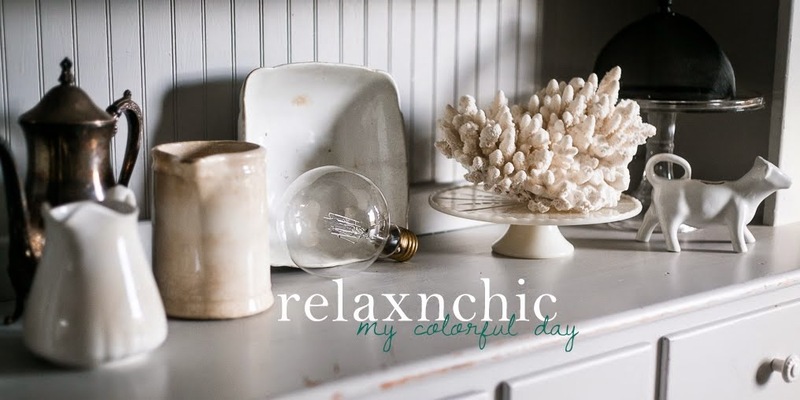 Click here to visit Lena's Amish Granola online store. Susan DiMickele » Christian. Working. Mom. Celebrating the Life of My Father: What’s Your Legacy?